All of 3-year-old Brooklyn’s dreams came true when she met Delvar Dopson on her birthday. Brooklyn Andracke is a big fan of her garbage man, who always honks the truck’s horn and waves when passing her house every Thursday morning. Scratch that. She’s a MASSIVE fan. Delvar Dopson is essentially her hero. 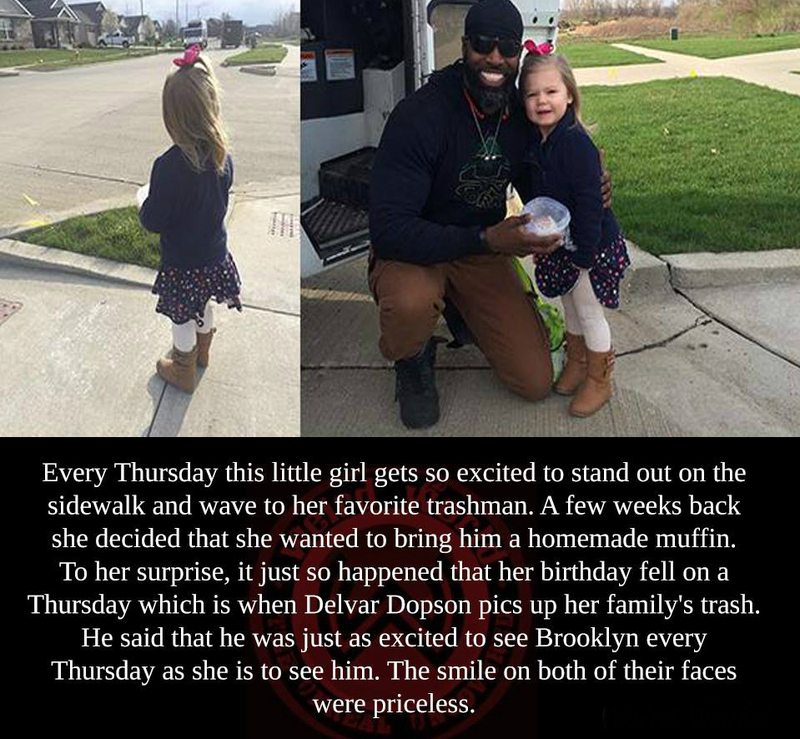 “To Brooklyn, he is our favorite awesome smiley garbage man,” her mother, Traci Andracke, told The Huffington Post. Brooklyn’s fascination with Dopson started because his truck would drive by their house in Bloomington, Illinois, every Thursday right around the time Andracke and Brooklyn were leaving for daycare. When the pair started going outside to see the truck, instead of watching it from inside the house, Brooklyn noticed Dopson driving the massive vehicle. So on April 7, when Brooklyn turned 3, the tot decided she wanted to share part of her big day with him. She patiently waited outside her home until Dopson pulled onto their street. When Andracke motioned for Dopson to stop the garbage truck, Brooklyn presented him with one of her birthday cupcakes.